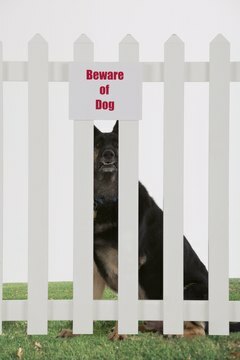 A strong fence is necessary to keep your dog contained. If your canine companion has a wandering spirit, he may put himself in serious danger. Roaming dogs can get hit by cars, picked up by strangers, and bitten by more aggressive animals. Not only is it dangerous to let your dog wander the streets, it may put you in legal trouble. Spay or neuter your dog. Hormones are a driving force behind roaming behavior, and altering your pet will reduce hormone levels and keep your dog from leaving home. Patch up holes or gaps in your fence. A dilapidated fence is an invitation to run, and even well-mannered dogs may take advantage of a lack of proper containment. If loose fence posts are a problem, dig out a little soil around each post and reinforce them with cement. Exercise your dog throughout the day. Many dogs wander because they have an excess amount of pent up energy, and keeping the dog stimulated will reduce his urge to run the streets. Provide the dog with fresh water at all times. If your dog gets thirsty, he may get out of the yard and go looking for a cool drink. Add ice cubes to your dog’s bowl during summer months to slow evaporation and keep the water cold throughout the day. Teach the dog that your yard is a fun place to spend his time. Some owners put their dogs outside when they are in trouble, and the dog may escapes out of frustration. Toss a few toys into the yard, and step out to play with the dog in small increments while he is outside. Take your dog to obedience class. Training gives your dog structure and interaction with other people and animals, and will help you develop better communication skills with your furry friend. Make sure your dog is fully vaccinated and stays on leash at all times during class. Never chain your dog up and leave him alone in the yard. Chained dogs may injure themselves if they try to escape.